Description: Ok, while I didn't literally go back in time, it seemed for it like a moment here in Peru with the Illinois Railnet! Description: A pair of rare CF7s lead the Illinois Railnet job through Peru. Description: Where else can you get a CF7, two SD50's, and two B23-7's in the same shot! Description: This engine was dropped in Eola by BNSF train "M GALCHC" and was taken up to Ottawa from the return Eola trip. Description: NKC CF7 (rare!) 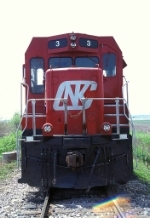 3 nd NKC GP7 2 sit at the Railnet shop in Ottawa. Description: slowly being divided up. Description: Lying in between a quarry and some woods she is almost gone. Her 567B block has been stripped and scrapped, part of her cab is discarded to the side, the main gen laying in the weeds, and her frame is sliced for easy shipping to the recyclers. Both trucks and other odd parts will go on to rebuild another locomotive. The saddest part about this locomotive was it was a fully functioning loco when it was parked.